As the name suggests, these colours are Henna based with as much as 60 to 70% Henna. Henna is a natural colourant being used by humans for over 5000 years. Besides colouring hair, it is also a very good conditioner, and its usage is growing very rapidly in many countries because of its health and therapeutic beneﬁts. Being a herbs based product, it is very safe as compared to 100% chemicals based hair dyes sold in the liquid & powder form. We are the leading manufacturer and supplier of a wide range of Natural Hair chemical that is available. Henna Powder (Lawsonia Inermis), Barium Peroxide, Citric Acid, Magnesium Carbonate, Para Phenylenediamine, Sodium Sulfite, Guargum, Amla, Shikakai, etc. Henna Powder (Lawsonia Inermis), Barium Peroxide, Para Amino Phenol, Citric Acid, Sodium Carboxy Methyl Cellulose, Sodium Sulfite, Para Phenylenediamine, Amla, Shikakai, etc. Henna Powder (Lawsonia Inermis), Barium Peroxide, Indigo Powder, Sodium Carboxy Methyl Cellulose, 4-Amino-2-Hydroxytoluene, Citric Acid, Sodium Lauryl Sulphate, Para Amino Phenol, Sodium Sulfite, Para Phenylenediamine, Amla, Shikakai, etc. Why Herbal Based Hair Colours? 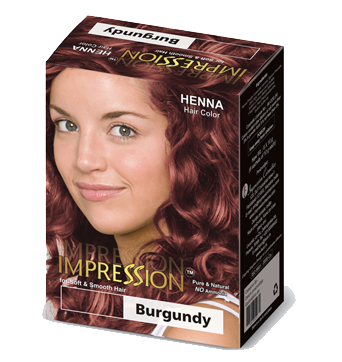 Take out the Impression henna hair colour powder in a plastic bowl. The hair colour market is dominated by cosmetic companies mostly marketing chemical based colours. It is an acknowledged fact that all chemicals have some side effects, compelling more discerning customers to explore herbal based substitutes. Since Henna had been used as a hair colourant and decorative medium from time immemorial; it was natural that scientists and cosmetologist made use of Henna as a substitute for harmful chemicals for making hair colours. Thus, Henna based colours have emerged as a viable and economical alternative to purely chemical based colours. When I am already using my cream/liquid hair dye with which I am satisfied then why should I go for Impression Henna based Hair Colours? There is 100% guarantee of purity of our products. Our company is registered with the Drug Controller of India and has ISI Certification. We are into herbal based products and all our products are produced without using harmful chemicals like ammonia, which cause harm to hair on regular use. Our hair colors are harmless to the hair. Besides this, they are less expensive compared to the well known cream based brands in the market, while imparting same results as branded hair creams do. I have sensitive skin. Can I use Henna/Herbal hair dye? Yes, of course. Henna can be used by anybody but for those with extra sensitive skin, using Henna or Herbal hair color could cause an allergic reaction. It is suggested that a hypersensitivity test should be conducted before use. Our hair colors are completely herbal based and have minimum chemical content, therefore chances of an allergic reaction are very low as compared to purely chemical based hair dyes. What is the reason for doing a strand test? Strand test is done to determine the result of the hair color on your actual hair. What is the need for doing a hypersensitive test? You should do a hypersensitivity test to find out whether you are allergic to a particular hair color or not. How long the hair color treatment lasts? In the normal course, results of the application of Henna based hair color last for about a month. You can repeat after an interval of one month. How do I know which color will suit me the best? We can provide you with a reference chart (on request) from which you can choose your color. We assure you that our hair color does not lighten your natural hair color. Is there a chance that I don't see a color change even after applying color? This is highly unlikely, however if you don't see a change in hair color, it means that either you have chosen a color which is too close to your natural hair color or you did not leave the hair color long enough prior to washing it off. What is the outer color of the powder of your company's hair color? The outer color of the powder varies from greenish to grayish to black. Initially, when the packet is newly packed, it looks greenish but over time, on account of oxidation it becomes grayish and then black. This however does not affect the quality of the product. Some people say that using herbal based hair colors causes cancer. Is it true? No, till date no study has claimed this to be true. Does the hair colors of your company result in premature graying? No, our products do not cause any premature graying. Premature greying is caused by different factors like lack of vitamins, mental stress, use of heavy bleaching chemicals, etc. I am pregnant. Can I use Impression Henna based Hair Colour? It is advisable that you consult your family doctor/physician before using hair dyes. What is the USP of Impression hair colour products? As a customer it is your privilege to compare one product from the other, in terms of quality, price, manufacturing process, ingredients used, we assure you that we supply the perfectly p/H balanced products which are gentle on the skin on application, which at the same time give the perfect results on the hair.